Stop me if you've heard this one before: Good Ole Cap finds himself thrust into a nightmare world where he's been twisted into the figurehead of a flagrantly evil regime and now he has to set things right. What's that? You have heard this one before? Really really recently? Huh, fancy that! 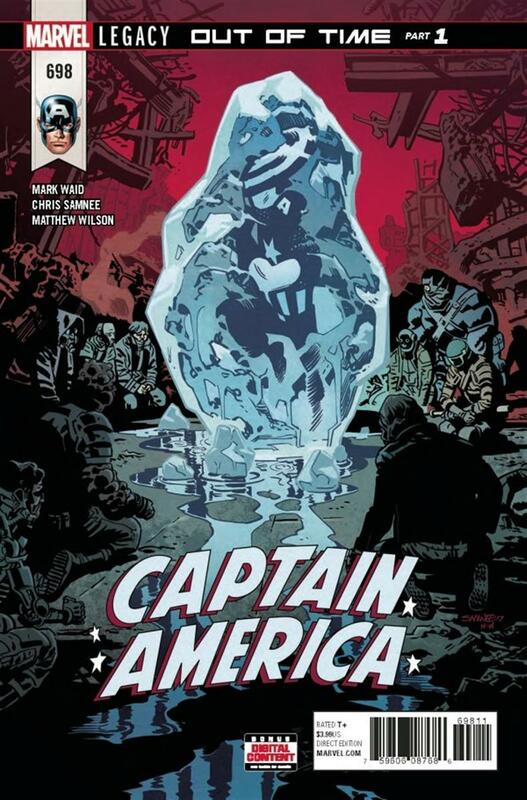 After sharing some stellar "remember Good Ole Cap" one-shots, Mark Waid and Chris Samnee drive their first ongoing arc hard into post-apocalyptic territory. Cap's just been defrosted by resistance fighters in a dystopian future. It's a solid set up for a promising story, but "original" is not the adjective that really springs to mind. There is one big surprise twist waiting when Cap gets the "Apocalypse How" rundown from his new pal, Liang the future resistance leader. The rest of her exposition is chockablock full of standard dystopian tropes dressed up with a few smart turns of phrase like "anti-egalitarian." Mark Waid's chosen income inequality as his social cause du jour. It's a perfectly fertile hill to plant your flag on, especially in 2018. I'm virtually certain that the point of this plot is to steer Cap into a situation very similar to Secret Empire so that the upcoming #700 can be a direct response to that mega-controversial event. Chris Samnee assembles an interesting slate of visual themes for this post-apocalyptic world. The Rampart goons who are running the place favour big red stars, clunky war machines, and over-fancy uniforms, producing an inescapable "What if the Soviets won the Cold War" feeling. Matthew Wilson's colours follow suit, spilling gallons of red ink over the baddies. The ruling elites also get some very retro fashions that echo Steve's pre-WWII days in interesting ways. The story playing out in this setting is impeccably paced and plotted, and it's a testament to the skills of the storytellers that while the ruined world around Cap looks mighty clichéd, we're still ready to stand up and cheer when he points the way toward revolution. Contrary to the impression I might have given above, this intro to Rampart's Bad Future isn't short of action. Cap gets to do plenty of shield-flinging wall-busting kid-saving heroics, all magnificently illustrated in Mr. Samnee's most dynamic style. Liang emerges as a highly relatable ally despite a few generic twinges, and her chosen nickname for Cap is wonderful. The dialogue throughout this issue is natural and memorable, and it's a lot of fun to hear Cap get absolutely flat-footed by the above-mentioned surprise twist. If the very idea of Cap hailing Hydra made you abstain from reading Secret Empire, you're the ideal target audience for this storyline.